So I found myself travelling east on Hollywood blvd on my way to an important engagment when I saw out of the corner of my eye a taco establishment called Dos Burritos(technically a burrito establishment with tacos). I checked my watch and I was making good time so I pulled over and ran inside and ordered a carnitas and carne asada taco. The cook was about to put my tacos on a hard plate but I asked for them to go(I was parked illegally). When I got back to my car I didn't have much salsa on my tacos but I dug in anyway. No big deal though cuz driving with salsa dripping down my wrist on to my le tigre shirt would have ruined my night. The carne asada was the first to go. The meat was soft,juicy and very well prepared. 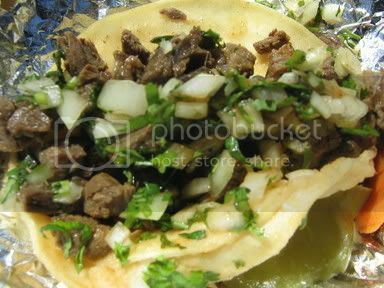 I didn't have the luxury of looking at my taco after every bite to see if any gristle was present so I pretty much put my faith in the taco and well I'm a believer. There was no gristle and the finely cut beef was very tender. The carnitas was pretty standard. The pork was soft with some crunch bits but I could have used some extra squirts of salsa roja to spice it up. In my haste I forgot to look at how much the tacos were . They must have been about a $1.50 each because I remember the total coming to just over 3 bucks. If that's the case it's a little steep for a street taco. 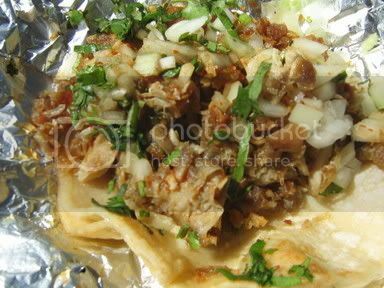 I'll have to head back there soon and try the other meats and actually sit at the taco counter and enjoy the tacos with a cold beverage. I guess you could call this drive by taco reporting. I prefer to savor my tacos and take my time with a cold bottle of lime jarritos but sometimes the situation calls for eating on the run. Yes, Dus Burritos. I have been to this place! I used to work in Hollywood and went there often. 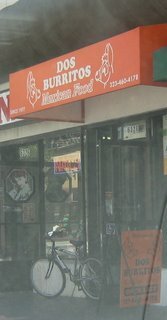 The tacos are pretty good...the burritos are better. There's something about the refried beans..excellent flavor...very creamy. Thanks for the drive-by! There's a ton these around,eh?. The only time I ate at one was in Van Nuys and there were carrots in my burrito. anonymous must be thinking of los burritos not dos burritos. dos burritos until recently (three years ago) was in the small shack in the parking lot next to the frolic room.alas,the shack was demolished to set up a freight elevator for the condo-ization of the old guaranty building on the corner of hollywood/vine. it took almost 2 years to reopen up the block but the food is the same as 20 years ago.same family but different staff. the pickled veggies on the counter cure all ailments.i pick out the huge garlic cloves. Thank god for Dos Burritos (in HOLLYWOOD,not Silverlake!) I emphasized Hllywd. because of the shortage of authentic Mex offerings in the area. I personally choose not to recognize the New Baja Fresh across from G's Chinese, especially not at the Touristy $$ of 2.50 a taco. Then there is the next nearest oasis on Sta.Monica & Greenacre,(near La Brea) Los Burritos! I remember going to this place the morning after i returned from vietnam with a buddy who used to live near there. we just parked on a side street along with a case a beers and inhaled our bean and queso burritos. My first mexican food after one year of crappy army chow!